Amsterdam: No eviction for hotels! The squatting collective ‘De Mobiele Eenheid’ stays! The squat collective De Mobiele Eenheid has squatted the Gedempte Hamerkanaal 86 / Spijkerkade 2 building a few weeks ago and has started a non-commercial social centre with a program of activities almost every day. After only a few weeks that the collective released the building from the control of real estate violence, an end to this freedom was threatening: The owner, Uri Ben Yakir, stepped to court because he intends to turn the building into a hotel. 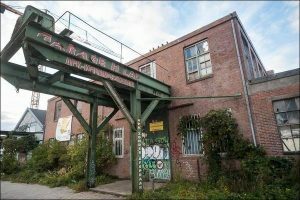 The judge ruled yesterday, November the 20th, that the squat collective Mobiele Eenheid can stay until February 1, 2019. The collective demands action from politicians and considers to appeal the decision in court and oppose the eviction. Amsterdam is full of hotels and overcrowded with tourists. There is little to show of the so-called Hotel stop that announced the previous city council. The owner of the squatted building in the Gedempte Hamerkanaal 86 / Spijkerkade 2, a diamond merchant, also knows that real diamonds nowadays have two legs, enter through Schiphol and pull roll-up luggage. If it is up to De Mobiele Eenheid, no hotel in the city will be added. As long as politics does not succeed, squatting is necessary. It is not the first time that the building has been squatted. In 2006, the building was squatted and also back then the story of the owner was that he would like to establish a hotel. Just like then, the owner threatened to shoot the squatters to death and fire up the property. All in all, the building has been empty for more than 12 years. Unfortunately, the municipality has done nothing during all these years. Not even when the law ‘Kraken en Leegstand’ that has been in force since 1 October 2010 gave the opportunity for this. After all, this law enables municipalities to counter persistent vacancy through fines. The bill is therefore used only half and selectively. It is used for evicting squatters, but not for countering vacancy. Squat collective De Mobiele Eenheid doubts whether the (undesirable!) plans of the owner have not changed in the meantime. Although the owner already received an environmental permit for the construction of a hotel in 2013, nothing has happened since then. The Mobiele Eenheid’s research in the Chamber of Commerce showed that the B.V’s of the owner is financially under water. Amsterdam should do everything in its power to withdraw the permit for the hotel and to counter it applying fines on vacant premises. In the coming years, a much-needed new neighbourhood will be erected around the Gedempte Hamerkanaal, where there is currently a business park. In total, 6,500 homes will be built. In a construction site, it will be impossible in the coming years to run a hotel properly. The expectation is that the building will be empty for years to come. The suspicion among the squatters is that the owner is awaiting the advance of the new housing estate and will try to sell his bankrupt property including building permit for the hotel. It is clear that the permit makes the property worth a lot more. We do not give way to a hotel or land speculation!